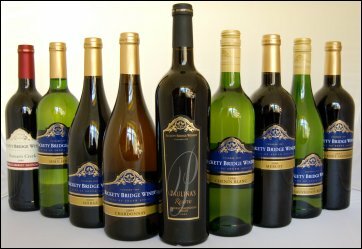 I was contacted by the UK importers of the wines from Rickety Bridge in South Africa, and asked if I’d like to taste their range. Vine growing on Rickety bridge’s farm can be traced back to 1829, and today the farm is a popular wedding and conference centre as well as producing wine. Based in the beautiful Franschhoek Valley, fruit for some wines is purely from Franschhoek, whilst others blend fruit from Stellebosch and surrounding areas. Whilst I enjoyed several of these wines, and there are a couple of stars in the line-up, I also wonder if there is some vineyard or cellar problem that has had a slightly dulling effect on some of these examples. Could Brettanomyces or leaf-roll virus (very common in South Africa) be the culprit? Certainly, some of the wines had rather indistinct fruit and a slightly animal character. I most certainly don’t mean to write this estate off, as their nicely European, restrained style is invariably food-friendly and savoury, and the best wines here are excellent, but I look forward to re-sampling these wines or tasting future vintages to see if this trait is in evidence.